The Joyetech CUBOID Lite Kit comes with a Joyetech CUBOID Lite TC Box MOD of max 80W output power, and a Joyetech Exceed D22 tank of optional 2ml or 3.5ml e-juice capacity. Top filling design, adjustable bottom airflow, and the Joyetech CUBOID Lite Kit supports Power/Bypass/TC(Ni, Ti, SS)/TCR (M1, M2, M3) modes. Available in Black, Purple, Red, Silver and Yellow colors. 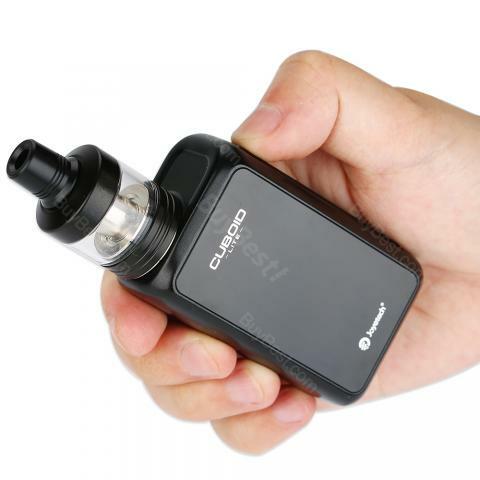 The Joyetech CUBOID Lite Kit comes with a Joyetech CUBOID Lite TC Box MOD and a Joyetech Exceed D22 tank. The Joyetech CUBOID Lite TC Box MOD is a build-in 3000mAh battery mod of 510 thread, with 1.45-inch TFT color screen, and the max output power is 80W. The Joyetech Exceed D22 tank is 22.5mm diameter of 510 thread, with the 2ml e-juice capacity, which is also can be extended to 3.5ml. The Joyetech CUBOID Lite Kit features top filling an adjustable bottom airflow, and the new EX series heads with large e-liquid holes will give you a great vaping experience. The starter kit supports Power, Bypass, TC(Ni, Ti, SS) and TCR (M1, M2, M3) modes and it is suitable for both MTL and DL vapors. Available in Black, Purple, Red, Silver and Yellow colors. I love Joyetech. The price is always reasonable. Very compact and style. I'd love my cuboud as starter kit. The parcel came very quickly and the product was very carefully packaged...and this coboid is very easy to setup and fill. All is satisfied.